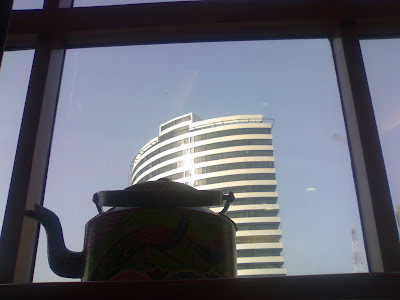 An awesome view with an old fashioned kettle in the forefront and a towering building in the background. A mix of traditional and modern symbols. I took this picture from the Oxford Cha-bar. Its a place where a variety of tea are on the menu and you can buy books and at the same time sit for hours flipping through the pages of your favourite books. Great juxtaposition of shots here. wow. sounds like a great place.